Looking for a reason to unwind from the stress of a long work day?? 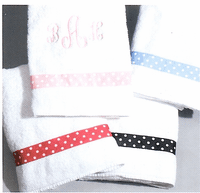 Look no further than with our line of personalized Spa & Bathroom Products. Nothing makes a person feel more special than a day at the spa; so, bring the feeling of a day out into the comfort of your own home with our personalized spa and bathroom gifts. 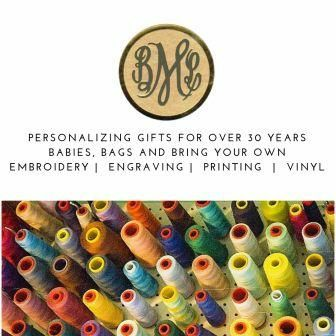 It's the perfect present for every occasion and with free personalization added to each item, they'll surely make birthdays, holidays, hostess gifts and wedding days all the more fabulous. 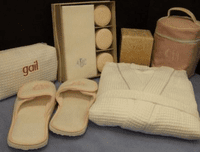 Plush terry beach towels & lovely white bath set!